Last week the cinema event for which the U. S. has palpitated for three years took place in Atlanta, Ga.the premiere of Gone With the Wind. Governor Eurith D. Rivers proclaimed a Statewide holiday, prepared to call out the National Guard. Atlanta's Mayor William B. Hartsfield proclaimed a three-day festival. To Georgia it was like winning the battle of Atlanta 75 years late, with Yankee good will thrown in and the direct assistance of Selznick International (which made the picture). Mayor Hartsfield urged every Atlanta woman and maid to put on hoop skirts and pantalets, appealed to every Atlanta male to don tight trousers and a beaver, sprout a goatee, sideburns and Kentucky colonel whiskers. He also requested citizens not to tear off the clothes of visiting movie stars, as happened in Kansas at the premiere of Dodge City. While the Stars and Bars flapped from every building, some 300,000 Atlantans and visitors lined up for seven miles to watch the procession of limousines bring British Vivien Leigh (in tears as thousands welcomed her "back home"), Clark Gable, his wife Carole Lombard, Producer David O. Selznick, Laurence Olivier and others from the airport. Crowds larger than the combined armies that fought at Atlanta in July 1864 waved Confederate flags, tossed confetti till it seemed to be snowing, gave three different versions of the Rebel yell, whistled, cheered, goggled. 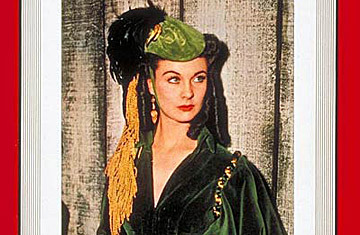 Highest point in the high jinks was a Gone With the Wind costume ball night before the premiere, attended by 6,000 celebrants, movie stars and executives galore, Governors of five former Confederate States. Gable's head was in a whirl. Hundreds of the prettiest little girls he had ever seen had surrounded him earlier. One looked at him a little too long, gasped: "Lord, I can't stand this any longer," fainted. An eleven-year-old girl, given a choice of getting a Christmas present or meeting Clark Gable, chose Gable. When Gable kissed her, she asked, "Now am I a woman?" Conspicuously absent from the ball was fun-loving, publicity-shy Novelist Margaret Mitchell, who stayed home with her husband, Adman John R. Marsh. Said friends: "Her dad's ailin'."